These Pet Rescue level 132 cheats and tips will help you beat level 132 of Pet Rescue. The objective of Pet Rescue level 132 is to clear 100% of the blocks and score 40,000 points. 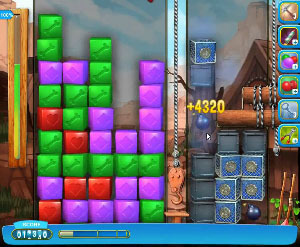 The board on level 132 is split into two halves, the left side consisting of normal, matchable colored blocks. The right side consists of metal blocks and one color of caged blocks that are going to be quite difficult to match. There are two bombs on the right side that you will need to explode to get things started. When you explode the bombs, they will break the cages from a few blocks. Now burst the balloon. It will react with the uncaged blocks and shatter the cages from a few more blocks so that you will be able to make a few matches. The right side will become unmatchable again fairly quickly, and you will need to switch your focus to the left side to help you out. Make large matches on the left side that are worth a lot of points to charge your column blaster booster. This will be quite easy, because there are only three different colors on the left side, allowing for huge match potential. Whenever your column blaster booster becomes charged, you can use it on the right side to eliminate a few metal blocks and caged blocks and get blocks moving and matchable again. Continue to use these strategies the whole way down. Use the left side to charge your column blaster booster. Use a mix of the column blaster booster and the available bombs to keep the right side moving and matchable. When you reach the ground, take more time with your moves so that you are able to clear all 100% of the blocks from the board.